The Vail Rugby Football Club celebrates its victory at the Cow Pie Tournament on Saturday, July 7, in Steamboat. Vail went 5-0 at the tourney and hosts Aspen on Saturday, July 14, at 1 p.m.
STEAMBOAT SPRINGS — One down, two to go? The Vail Rugby Football Club took care of step No. 1 of the summer-rugby scene’s triple by winning last weekend’s Cow Pie Tournament in Steamboat Springs. The Blue and White capped a 5-0 performance with a 17-10 victory over the hosts in the final. That’s got to be a big boost for the local 15 as it enters the meat of its schedule with its annual fixture against Aspen on Saturday, July 14, at 1 p.m., at the Vail Athletic Field, followed by the Ski Town Tournament in Aspen the next weekend. The triple is winning Cow Pie, Ski Town and the Mountain League all in one summer. Only two sides — Vail in 2015 and Aspen in 2017 — have won the triple, which adds import to Saturday’s renewal of the rivalry, as if it needed any. When a rugby club hosts a tournament, it does two things — gives itself the easiest draw to the final and tries to get all comers riotously drunk the night before the games. Thus Vail had an 8 a.m. game against Wyoming to start the Cow Pie. And while Vail’s lads do like a frosty cold one, the club has a greater purpose this season. With Major League Rugby having just finished its inaugural season, Vail is packing its roster with collegiate players working on developing their skills with the new league in mind. Thus, the Blue and White stayed away from temptation and bulldozed its way to a 24-0 lead on the way to a 31-10 opening win. Vail won its pool by taking care of Echo Mountain, a Denver based side, 17-12. In the quarterfinals, the Blue and White advanced easily, dispatching Jackson Hole, Wyoming, followed by a 22-14 victory over Boulder. That set up the final against Steamboat, and a well-earned Cow Pie title. As a side note, the trophy is not an actual cow pie, and all involved are grateful. While Steamboat is always a player in the Mountain League table, the circuit usually comes down to Vail and Aspen, which makes this weekend’s match loom large. 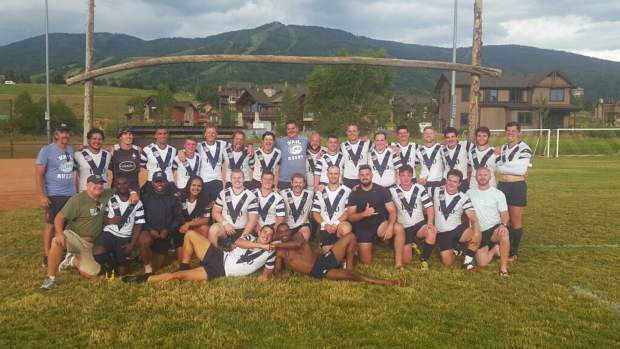 To get “Aspen Week” started, Vail is hosting a barbecue on Wednesday, July 11, an event which will involve everyone from the current squad to old boys, alumni of the club, as well as the Bulldogs, a 7s program coached by Vail alumnus Steve Lewis. While the match at 1 p.m. on Saturday headlines the day, the team will be holding a touch-rugby match for its youth program at noon.